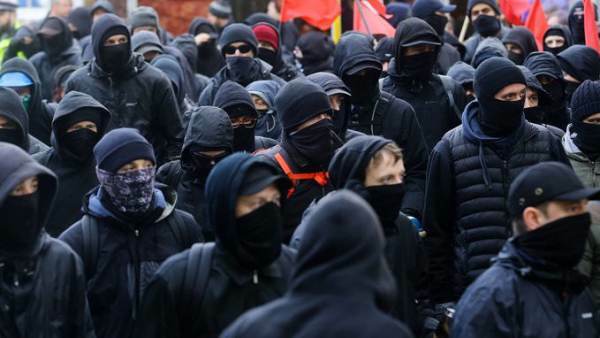 NOTE: These cowardly Antifa mobsters cover their faces just like ISIS does. Crises actors - staged - trying to start another Red Revolution (1917 was the 101st anniversary on Wednesday, when this mob action occurred. The Daily Caller is one of the good sources of news, not allied with the Illuminati-CIA run Deep State Fake News. Yes, there is a connection. These Commies will start a revolution by violence if all else fails. Let us pray that the Lord will protect us. committing actual violence has ever been prosecuted. They are treated with kid gloves by the police. Many Police Chiefs and Sheriffs are trained by the Israelis IDF and practice their new skills on the Palestinians. Yes, there are probably hundreds of thousands of federal employees who are sympathy with Obama, Clinton, Soros, and Antifa, and who are working to destroy the USA. I hope that Trump is eventually able to fire and/or imprison these unfaithful public servants for their treasonous unAmerican activities. God bless and protect the USA from these wicked ones. Antifa are a bunch of hostile queers that are being paid by perverts of satan. Cool. They keep it up and there might just be another Charlottesville, that they can endlessly whinge over as if they weren't actively beating people in the streets and threatening to do what the driver of the car actually had the spine to do himself. They never seem to understand that both the American conservatives, and the fascists, are always more capable of brutality and violence than they are. They keep on prodding the "far right" and they're going to have a really bad time. The Deep State and Israel protect and support ISIS overseas and the Deep State protects Antifa in the U.S. A common element was behind the founding or rather morphing of al quaeda into) ISIS and the founding of Antifa. Hint: the element is a 4 letter word starting with J and ending with s. And no that's not conspiracy theory, although there was most definitely a conspiracy involved in both actions.